We’re back to provide our thoughts on what the initial Sabres roster will look like for the season as Derek Grant, Hudson Fasching and Casey Nelson among those impressing in the preseason. Along the way we touch on some of the seemingly inaccurate statistical models projecting the Sabres season and the stunning lack of discipline applied to Radko Gudas’ latest indiscretion. Be sure to subscribe on iTunes so you never miss an episode. Well that was a fun couple of days, no? A 5-2 beat down of the Flyers followed by a near textbook road win against the Leafs and the Sabres have gotten off on the right foot for this shortened 2013 season. Sunday’s opener was about as sloppy as expected, as the Sabres and Flyers plodded through forty minutes of fairly average hockey before the Sabres third period explosion put the game away. The one takeaway from that opener was seeing the rust on both teams. Even with a game under their belt from the day before, the Flyers still looked sluggish in many ways along with their hosts who were playing their first game of the season. The Sabres did do plenty of things right, however. They engaged physically from the opening faceoff, scored the game’s first goal and maintained composure after falling behind in the second period. Drew Stafford’s unexpected fight was pointed to as the spark that drove the Sabres into the third period and their scoring surge in the final frame got the job done. The Predators took a necessary and expected step today by matching the massive 14-year offer sheet that Shea Weber signed with the Flyers. This guarantees that Weber will be in Nashville for the foreseeable future. Nashville cannot trade Weber for this year, but it is plausible to think that they could work out a deal with Philly next season if they absolutely need to be out from under that contract. But with most chatter centering around a NTC/NMC for Weber, that seems quite unlikely. Matching the offer sheet also guarantees that the Flyers do not end up with Weber. From the perspective of those who hate the Flyers, this could be both a blessing and a curse. While Philly will no longer have the services of Weber for the next decade-and-a-half but now have well over $7.8M in cap space to play with. That means they can go whole hog after Shane Doan and Bobby Ryan. Now that the Weber situation has been resolved, Rick Nash has found a new home and with the Parise and Suter sweepstakes long resolved, everyone’s attention will be turned to Doan and Ryan. Since the Flyers have the financial freedom to explore every option available, they’ll surely big a major player for each of the right wingers. Ask yourself this. Would it be worse to see Shea Weber in Philly for 14 years or see them acquire Doan or Ryan as a result of missing out on Weber? It was all too similar to so many Sabres letdowns in the past. 20 minutes from a victory and a bend but don’t break mentality leads to a breakdown and a loss. Unfortunately, last night’s breakdown ended up being the final domino to fall on the Buffalo Sabres’ season. Ville Leino opened the scoring and Ryan Miller was great in net, but it wasn’t enough. Buffalo tried to shell up in the third, allowed 16 shots and a pair of goals on their way to a 2-1 loss. The loss, coupled with Washington’s regulation victory sealed Buffalo’s playoff fate, and that was all she wrote. Not to be a complete downer on the loss, but it played out just as you might expect it to. Buffalo was rather tentative for most of the game, but managed to capitalize on one of their better chances on the Leino goal. However, the Sabres came out for the third just hoping to hang on to the one-goal lead and escape with two points. I understand their losses on the backend, but that third period effort was in-ex-cus-able (go to 30 seconds). The Sabres had already been outshot 19-16 entering the third period only to be outshot 16-10 in what would turn out to be their most important period of the year. Whether this falls on poor coaching decisions, mental weakness or just the wrong mix of players, the third period was basically a microcosm of the entire year. With the loss, Saturday’s matinee in Boston becomes next to meaningless. The Bruins will likely continue resting a number of their regulars and the Sabres will likely send some (or most) of their AHL call ups back to Rochester while re-inserting some of their ailing veterans. Also it will mean that Jhonas Enroth will get the honor of the next Sabres backup to play the final game of the season, finally giving Ryan Miller a night off. As the offseason begins for the Sabres, there will be plenty of necessary questions that will need to be addressed. How the Sabres management chooses to address them is anyone’s guess. Ryan Miller took a bold step by responding to the (now fulfilled) guarantee made by Brooks Laich. His game responded as well. Miller turned aside 33 shots and was a big reason the Sabres weren’t simply run out of the building. For those who say Miller doesn’t show up when his team needs him, take this game into consideration. Robyn Regehr, despite his plus/minus, has been a sound performer for the Sabres this season. However, he looked mighty bad as Matt Read steamed past him to score the game winner. Surely many fans will assume he was awful all year because of this one play and his stat line. Regehr’s partner, Andrej Sekera chose a bad time to regress in his play. That pair had been phenomenal for long stretches recently, Sekera’s handful of ugly nights came during a run of games that ultimately cost Buffalo the season. Sekera was improved this year, but his detractors certainly won’t forget this run of hockey. Jody Shelly. Yes, Jody Shelly had three shots on goal and two scoring chances. Thomas Vanek, Derek Roy and Jason Pominville combined for four shots. Vanek’s only appearance on the stat sheet was a missed attempt and one hit. Remember when he was the first half’s MVP? T.J. Brennan played some solid hockey earlier in the year. In fact, his play was a prime example of how expendable Grocery Stick Gragnani was. But Brennan was quite average for this most recent recall. I wonder where he fits in the long-term plans with players like Matt MacKenzie, Mark Pysyk and even Brayden McNabb in the pipeline? Not counting the addition of Regehr, I think the Sabres missed the boat on adding a true veteran presence – think Marc Recchi with the Bruins last year. I will remain adamant that the Sabres mental toughness is sorely lacking and a true veteran leader up front would probably do wonders for the locker room. I’m not very interested in looking at the silver lining of the tremendous run the team just went on. Yes, there were some bright spots. Namely, Miller’s resurgence, Folgino and Ennis coming together and the revelation that Christian Ehrhoff was truly money well spent. But I’m not going to hang my hat on the “well, it was a great run” bandwagon. For what it’s worth, Ville Leino’s production when playing on a line with talented forwards wasn’t too horrible. The fact that he was bounced around for much of the year could say a lot about why his numbers were poor. He has talent worth keeping around, he just needs the proper situation to succeed. There has to be some correlation with how the Sabres are coached and the ridiculous things that continue to happen. Third periods like last night, the continued use of that useless neutral zone drop pass, yet another too many men penalty, the general lack of that killer instinct to each game. Is it the coaching? Is it the players? I’m not entirely sure, but if this team is truly going to be a winner, that needs to change. Yet again Sabres fans will be touting tonight’s game as the biggest of the season. In a way, they’re correct. However, they’re also putting too much weight on the singular aspect of tonight’s game against the Flyers. Yes, if the Sabres do not win this evening they can all but kiss their playoff hopes goodbye. However, if they win, they will be playing in another biggest game of the year on Saturday. See how silly this is? What made me realize this is the accusation that many Sabres players seem to receive regarding their status as big game players. Don’t confuse this with mental toughness. I’m just talking about those who are criticized for not showing up when their team needs it the most. Whether you’re talking about Thomas Vanek, Jason Pominville, Ryan Miller or anyone else you wish to pick on. Saying these guys don’t show up when it counts is a load of crap. Every game is relative to the ones that come before and after it. There isn’t necessarily one biggest game, so to speak. Look at it this way. Had Ryan Miller not gone on his torrid streak, the Sabres would be talking draft picks right now. The same goes for last week against the Caps. That was the biggest game of the season, to that point. Miller performed and the Sabres rolled. Derek Roy was the hero on Tuesday but was chastised much of the year for not stepping up when his team needed him most. I’m not saying that criticism of Roy isn’t warranted at points, the same goes for Miller and other players. Had the Sabres shown up last weekend, these final two games wouldn’t matter as much. So which game matters the most? What you need to realize is that bitching about a player’s big game-ness is a futile task. Hockey is a team sport and is played in a marathon setting, not a sprint. The collectiveness of the whole effort is what matters most, not necessarily one player’s actions in one game. Now, allow me to contradict myself. Tonight’s game is massive, there is no getting around that. The Sabres remain in do-or-die mode as they try to sneak into the playoffs. They face a tough task playing a Flyers team that has owned them for the whole season and are still battling for home ice in the first round. The only thing to Buffalo’s advantage is that the Penguins have distanced themselves from the fifth-place Flyers by a bit and Ilya Bryzgalov is just returning from injury. The Sabres have been a defensive train wreck these last three games and they desperately need to remedy this if they hope to skate with Philly. The Flyers have a potent attack that will dice the Sabres if they don’t play a responsible game. 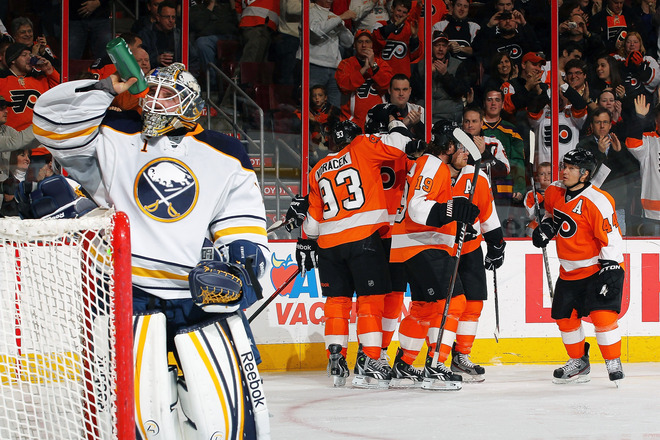 Buffalo has been scoring goals lately, getting to Bryzgalov early will be important. He was yanked against the Rangers and will still have some rust to shake off tonight. If he is unsettled, the Sabres will have a glorious chance at getting two points. Sabres’ defense vs. Flyers’ big guns. Philly boasts a number of potent scorers; Buffalo’s blueline has been depleted and has given up some glorious chances the past three nights. The Sabres need to be physical and engage the Flyers early to prevent scoring chances. Too often the Sabres have played soft on entries and offensive cycles which has allowed time and space for their opponents. Unless that is remedied it will be a long night for Ryan Miller. You can all but chalk this one up for the lottery. With few losses to give the Sabres have dropped three-straight and made a complete mess of one last night in Philadelphia. The 7-2 loss pretty much locks away any hope that was left for the playoffs. What a way to end those hopes, too. A 2-0 lead after the first, a shaken opposing goalie and a generally angered fan base. The Sabres returned for the second and allowed three tallies inside seven minutes, ultimately yielding the final seven goals of the game. Jhonas Enroth was chased after giving up three and Ryan Miller didn’t fare much better, giving up four during his time in net. Each goalie had one that they should have stopped – Simmond’s first for Enroth and Voracek’s for Miller – but each were hung out to dry for the whole night. Even on the two that should have been saved, the defense were either out to lunch (Simmonds) or the entire five-man unit were coasting back on defense (Voracek). People bag on Miller for shrugging his shoulders after being beaten, can you blame him? Tonight was a unique circumstance of plain old ugly hockey; but when you have no support from your teammates, what else would you expect? The mental toughness of this group – of the “core” – has long been questioned. Continually blowing leads when they can stomp their foot on their enemy’s throat have been a perpetual nuisance. If there is one thing the deadline and offseason needs to yield, it is veteran talent who will teach the young players how to play with heart. Tyler Myers made a great feed on Jason Pominville’s goal in the first. He then proceeded to play below average defense the rest of the night. A nice pass, but his defensive play could use some improvement. Speaking of the team MVPs. Thomas Vanek and Pominville continue to amaze. Another pair of goals from the team leaders while the rest of the forwards sit back and watch. If I was a player wearing a different number than 26 or 29, I’d be fearful of finding a new apartment in the next two weeks. Moving Vanek to the right wing with Tyler Ennis was a wise move. Keep Ville Leino in a top-six role and let him feed off the talent on his line. That is the only way you’re going to see results from him. His play has been markedly iimproved since his promotion. All six defensemen were in rough shape last night. The penalty kill coverage was poor and at even strength they were lost. It was a team failure defensively and the goaltenders had to pay. It is truly difficult watching a team sleepwalk through a game the way Buffalo did tonight. Give some ups to Zack Kassian. He threw with one of Philly’s goons and came out a winner. Tom Sestito threw plenty of punches but missed on most. Kassian threw a few and landed a pair of bombs. Kassian needs to keep the grit in his game, especially if he is to see big minutes beyond the deadline.